When your planet's sun is dying, what can you do? Find a new home. That's what the Ryxins did throughout the galaxy, and 150 of them secretly arrived on Earth in 1905. Once they'd changed into Human form they began to infiltrate Earth's population.By the year 2020, long after their presence was discovered, Curtis McCoy, half-blood Ryxin and newly trained private investigator, is on his first case. A murder mystery set in a world where a dwindling number of pure-blood aliens seek to gain power over Humans, the dominant species. It takes place on a small island called Muritai, somewhere off the coast of New Zealand. 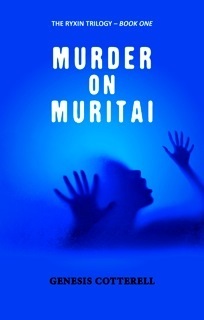 A murder on the island of Muritai has been made to look like an accident and his client, a beautiful half-blood woman with blond hair and green eyes, wants him to find her partner's killer.